I have been picked for TEAM PHILLY with 3 other mom blog friends. Our team is competing against 3 other teams in a nationwide Rice Krispies Treat Challenge. This is the first of four we get to do this year. HOW FUN, RIGHT?!?!?! What's in it for you? Well-a fab recipe AND A CHANCE TO WIN A $100 VISA GIFT CARD!!!! The day of the event, Tara Bucci, Sarah Peppel & Zareen from CookingwithZ.com all came on over! I barely have any kitchen pots/pans (totally embarassing) so they all brought one. I knew I was at the right house when I saw the recycling bin full of Rice Krispies Cereal Boxes! Brave Joey had tried one display idea that just wasn't happening. We put our heads together and came up with this fun recipe! Instructions: Melt Butter in large pot over Medium Heat. Mix in marshmallows and Cocoa Rice Krispies. Turn heat to low as you add coconut and butterscotch chips. Mold into egg shapes and set on tray. Follow directions on the bag to microwave candy melts until liquid. Dip into melted chocolate, whole or halfway. Sprinkle with colorful sprinkles and pipe with icing as desired. Kids LOVE this! *Coconut could be optional. I'm not a coconut fan-but I loved these! The Butterscotch is what really rocks! All 4 of our blogs are running seperate $100 giveaways - so be sure to visit them all! And while you're at it- PLEASE PLEASE PLEASE 'like' our Cocoa Butter Krispies entry on Facebook!! This is a contest after all and we need YOUR help to win win win!!! 2) Additional ways to win: Share to your social fun: Blog, Tweet, and/or Facebook a link to this post. Be sure to come back here leave seperate comments below with links to your extra entries! 4) Contest ends at midnight April 11, 2011. Winner will be randomly selected via Random.org . Abbreviated Rules: No Purchase Necessary. Begins no earlier than 12:00:00 AM (ET) on 03/28/11 and ends no later than 11:59:59 PM (ET) on 04/12/11. For complete Official Rules, go tohttp://web.mediacdt.com/docs/EasterGiveawayRules.pdf. Open to legal residents of the fifty (50) United States and District of Columbia who are 18 years of age or older at time of entry. Subject to complete Official Rules. Void where prohibited. Sponsor: The Motherhood; www.TheMotherhood.com. Disclosure: This is part of a paid campaign sponsored by the makers of Kellogg’s® Rice Krispies® cereal ®, TM, © 2011 Kellogg NA Co.
We are competing with teams from Phoenix, Kansas City and Asheville! 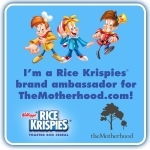 To see their entries, head over to The Motherhood Rice Krispies Circle where we will be posting our recipe too. Like to win prizes? Be sure to check out other PSMM members and their giveaways!